Touring by kayak gives you an intimate view of Dalmatia. The islands are small and close together, so paddling by kayak is an ideal way see a great deal in a single day. Pedal and Paddle begins with a ferry ride to Lopud Island from the ferry terminal in Dubrovnik's Gruz Harbor. Full-Day Tour: Mon.-Sat. 9:45 a.m. / Sun. and Holidays 8:45 a.m.
Paddle from Lopud to Šipan Island, the most remote of the three inhabited Elaﬁti Islands. A one-hour paddle brings us to a small fishing village on Šipan, where we abandon kayaks for bicycles. Šipan has a rich and colorful history dating back to Ragusa’s 15th century Renaissance. A single tarmac road bisects the island, connecting its two small villages. 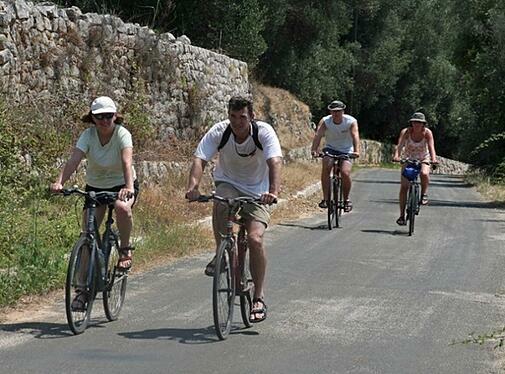 Cycle past vineyards, aristocratic villas, olive groves, old stone churches, and lush landscape to Luka Šipanska, an unpretentious village nestled in a deep bay. Lunch in Luka affords beautiful views of the outer uninhabited Elafiti Islands backed by the Pelješac Peninsula beyond. Pedal to the island’s small sandy beach on a peninsula for a swim in Luka Šipanska’s inland bay or venture into the open sea. After swimming, hiking, and lunch in Luka, cycle back to kayaks for the paddle back to Lopud and the ferry ride home. Lunch, at a small restaurant in Luka Šipanska's serving the day's freshest catch, is one of the many highlights on Pedal & Paddle. Lunch is not included in the tour price. Bring a bottle of drinking water, sun protection (hat, sunglasses, sunscreen), towel, a dry layer for the ferry ride home, and money for lunch. We eat at a fantastic restuarant we cycle to. A camera is optional. Wear a bathing suit with clothes over. AKT supplies all of your kayak and snorkeling gear, including aqua shoes for kayaking, swimming, and walking on the rocky shoreline. We supply dry bags for your personal items (wallet, camera, clothes, towel, and phone), which stay dry in your dry bag stored in your kayak bulkhead compartments while you are kayaking. These items are available while you are on the islands. You may want a small backback for the bike ride.